The past two weeks have been pure bliss. Husband and I have had so much quality time together, been on dates in the middle of the day just because, and checked a lot of projects off of our ever-growing honey-do list. While I'm sad to see our holiday break come to a close, I'm also ready to turn this year into an extraordinary one and get back into the swing of things. And I'm starting with this blog of mine. I'm excited to share that Rachel from Floral & Fudge and I are teaming up to bring you the Every Girl Link-Up! This link-up will run all year long and will highlight facets of every girl's life each month, sometimes twice a month when holidays and seasonal changes occur. We hope you are just as excited to share in this link-up, and we're looking forward to interacting with all of you. Here's how it will work. On the dates given below, write your post, grab our button (located on my sidebar), and link up with Rachel and I. Then get to know the other bloggers that link up! Simple, fun, and the perfect way to interact with some great gals. 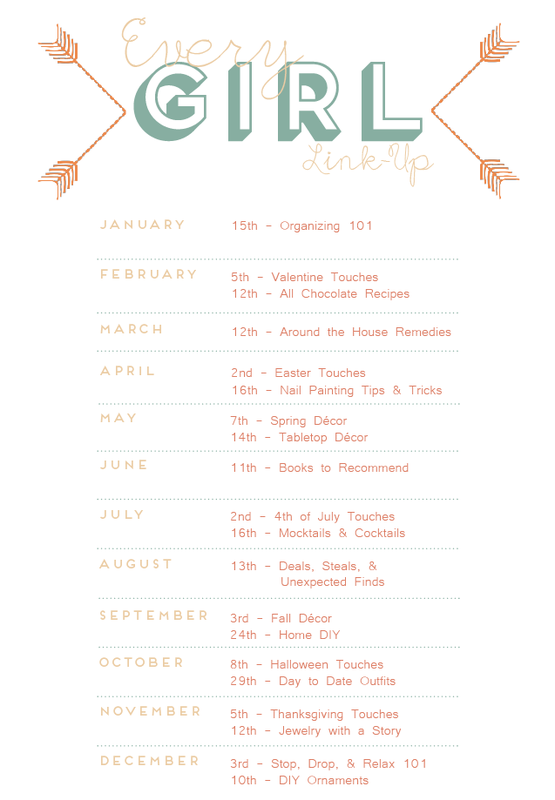 Our first link-up will be next week on the 15th, and we're sharing the ways we organize best, the little and big tips and tricks around the house and in our personal life (hello planner, I couldn't live without you!). Looking forward to linking up with you! And I hope your Monday is a good one, especially if its your first day back to routine!